View More In Car Safety & Security. 18- AWG male & female waterproof connectors with 10cm wire. Operating temperature : -40℃~+120℃. Easy to install under soldering and crimping. 3 position rectangular housing connector black 0.24". 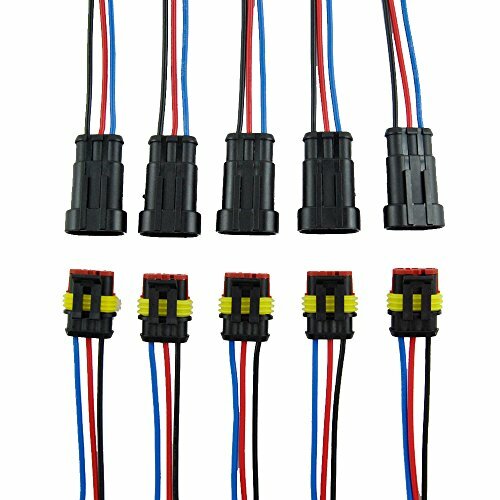 5 Kit 3 Pin 18 AWG male & female waterproof connectors with 10cm wire. Easy to install under soldering and crimping. 3 position rectangular housing connector black. Use for car, truck, boat, motorcycle, and other wire connections. If you have any questions about this product by MUYI, contact us by completing and submitting the form below. If you are looking for a specif part number, please include it with your message.